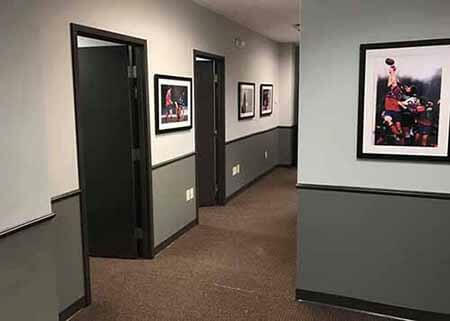 Commercial projects demand paint contractors who understand deadlines, coordinating with other contractors on the premises and unique safety requirements. Our expertise includes medical, retail and industrial projects. We are well-versed in the RFP process and commercial bidding. We welcome the opportunity to review your project and provide an assessment of needed work, estimates and coordinate with your schedule for on-time completion. Our scope of work includes projects where numerous contractor specialties are on the job site. We'll coordinate to ensure the work is completed with maximum efficiency and cost effectiveness in mind. And we may be able to save you money for any on-site repairs, drywall or other minor renovations you may need. Give us a call when your business needs painting services and we'll provide a quick, transparent estimate. As customers drive up to your business, the exterior of the building gives customers their first impression. Make it a look that sets expectations of what's to come. Give it a professional look with high quality exterior paint in appropriate colors for your business. Our Color Expert has designed hundreds of business exteriors and can recommend a color palette suitable for your industry and place of business. We can match logo colors, franchise templates and designs you want to incorporate into the look. We use only top quality Sherwin Williams paints and offer choices among those. For exterior painting, Sherwin Williams offers paint products with expected lifespans ranging from 5 to 17 years. We'll note these options and let you choose what works best for your business. For interiors, we offer similar choices among the highest quality paints as well as a hypo-allergenic paint which is a good choice for allergy suffers. 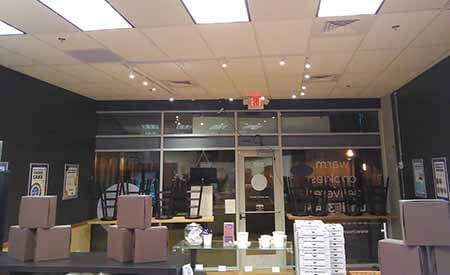 Our recent storefront retail project in Mid-Town Atlanta can be seen in the header image on this page. While taking cookie breaks the owners provided for us during the day, we kept pace with the fast turn-around we promised. Clean lines, bold colors and an inviting space are reflected in the palette and design for this project. We offer color consultation and can easily match existing logo colors or suggest fresh options for you to choose from. Our color expert has worked with hundreds of businesses making design and layout an easy and fun task. Give us a call the next time you want an updated look for your retail space. We provide both interior and exterior painting for medical offices and will always mention Sherwin Williams Anti-Microbicidal Latex Paint for interiors regardless of the project so you are aware of the benefits of this product. It is the first EPA registered paint shield that kills more than 99.9% of Staph, MSRA, E.coli and VRE within 2 hours of exposure. The certification provides it continues to kill 90% of these bacteria after repeated exposure and that the effectiveness lasts for up to 4 years as long as the integrity of the surface is maintained.